Other mat thicknesses are available on special order. The lead-time for special orders is usually around 6 to 8 week. This is to cover the time required to manufacture the mats and shipping time which itself take 3 to 4 weeks. For example customers that require extra protection can request 50mm or 60mm EVA jigsaw mats. These and other thicknesses need to be special ordered. Simple contact Ezymats for a quote and further information. Our friendly staff are always happy to help. The thickness of the mats depends on the use of the mats. It is up to the user of the mats to determine what thickness is required for their activity or training area. The 40mm Jigsaw Mats more suited for falling martial arts. The would including sports such as Judo, Jiu Jitsu and Aikido as the 40mm thickness offers more protection. Constant throwing and grappling can often lead to injury if adequate padding is not available during impact. Also other aspects of their training like rolling and break-falls require protection. Therefore, the thicker the mat the better the protection.The 40mm jigsaw mats also offer excellent value for money because they offer more protection then mats which are half as thick yet not half the price. For this reason they are a popular choice of jigsaw mats. Customers that don’t require so much protection can chose to opt for thinner mats such as 20mm or 30mm. These mats also offer good protection during training activities. They are also more cost effective then thicker mats and cost less to ship. If there is a need to store the exercise mats and there is limited storage space then a thinner mat may be a good choice. Although our standard sizes are 20mm and 30mm again different thicknesses can be ordered on specially order. The factory has the capacity to manufacture 15mm and 25mm mats. The 30mm jigsaw mat might be thinner but they are still popular for a broad range of activities. Even with grappling martial arts they are popular as they are thick enough to offer protection. If you visit a BJJ school you are probably as likely to find 30mm as you are 40mm, particularly is there is no MMA component in their training. With grappling arts such as BJJ they are especially sought after as most of BJJ training is confined to the ground. While there are throws in the system most of training occurs on the ground as too does the “rolling” component. Other wrestling activities that find that they spend less time on their feet then on the ground also may conclude that a thinner mat might more suitable for their training area. With 20mm jigsaw mats you will find that they are mainly used where there is less falling involved and less transition between the ground and standing position. So while they are great for aerobics and martial arts like Tae Kwon Do, they might not be recommend for something like judo or jiu-jitsu. Indeed if you walk into most gyms where there is an area fitted out for palates, yoga etc there is a likelihood that there will me 20mm mats in use. They may be thinner then the other mats but they still provide protection. They are great for reducing fatigue during training and other activities. If you have a hard surface such as concrete it is a good idea to have foam flooring. It is important to note that whilst training mats can provide protection again injury they are no substitute for common sense and a well planned training regime. While the mats are intended to reduce injury during falls they may not be effective if you fall in a precarious position such as your head or neck. It is therefore important to take care when you are training as prevention starts with you. Also where the mats are intended for areas fitted out for children it is imperative that you have adult supervision. Again the mats might reduce injury by reducing impact during falls but can not prevent them all together. 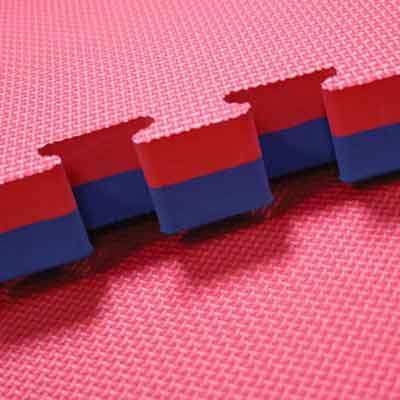 EVA jigsaw mats are a popular choice for many different activities which is why Ezymats stock the three most popular thicknesses and different colour options. Ezymats also stock a variety of other mats for gym fit out like tatami mats, MMA mats and wall mats. With two large warehouses in both Melbourne and Sydney there is a good chance that we will have the mats you require in stock. We also have new shipments arriving all the time. If you require additional information or advise our friendly staff would be happy to help. Either send us an email or give us a call. Contact details can be found on our “contact us” page.